As we move into February, our streams and rivers up here in the southern Appalachia’s should become the coldest of the year. Extreme cold water and trout usually do not go hand in hand very well. What I mean by that statement is trout simply slowdown in everything they do. Several things take place when water temperatures get down around the 40-degree mark. Trout are cold blooded creatures and they become whatever the environment is. So, that fish in 40-degree water is 40 degrees. Think about how you would feel in an environment such as this. It’s surely not like that spring day with the sun on your back. A trout’s behavior will greatly change when comparing 40-degree water temps to say 50-degree. They will be more inclined to find good holding water that still has some current. Keep in mind, the current is what will bring them food. Trout will use larger rocks for cover, but any log jams will offer better cover and habitat. Look for deeper water, especially, anything over three feet or deeper. If you know where an underground spring enters the stream, ground water will be warmer than surface water. These are all keys for locating wintertime trout. Trout feed when there is food to be eaten, but the amount depends on their size, availability of food and the water temperature. Water temperature affects their metabolic rate and their desire to eat. When the water is cooling off day in and day out and the temperature gets down to around 45 degrees, trout will need less food. This doesn’t mean they stop eating but just not as much. Once the temperature reaches 40 degrees, trout become fairly lethargic. A good friend of mine says you just about have to hit them on the nose to entice them to eat. If water temperatures reach the 35-degree mark, it is possible that death will occur. Just as trout slow down on falling temperatures, the opposite will usually occur on increasing temperatures. Carry a thermometer to check the water temperature. Keeping a daily track of water temperatures can help lead you to success on the water. Wintertime on the fly can be fun and entertaining for any angler. Some things to keep in mind. Don’t be shy with weight. Many trout will hug the bottom of a stream during the wintertime since it has the least current, and they can almost sit there effortlessly. Continue to add weight to get your flies to get them down to the proper depth - the bottom! Dress for success. Nothing can be worse than being frozen while on the water. Bring proper clothing for the day. Remember, you cannot wear what you do not have with you. Try to hit the stream from 11 am to about 4 pm as this is usually the warmest period during most days. One last note, try to fish after warming period. Usually the third or fourth day of air temps in the 50 to 60-degree range will make for some fun hookups! If you are a first timer wanting to learn to fly fish, we have several instructors who have been schooled in the art of teaching fly fishing. The best way to learn is to spend time with those of us who are professional full-time guides. If you are new to the area and do not know where to go, give us a call for info over the phone. If big water is intimidating to you or if the Toccoa River DH section is too rough for you to wade, we float the Toccoa with drift boats. Give Us a Call, We’ll Hook You Up! James Bradley is the only Orvis Endorsed Fly Fishing Guide in North Georgia’s Historic High-Country region. Reel Em In Guide Service has been offering their services to fly anglers since 2001. 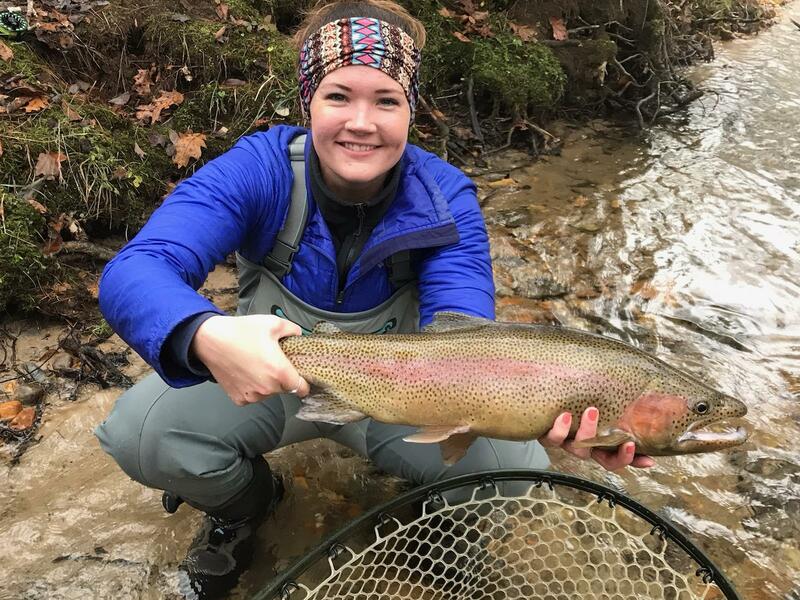 They have permits for guiding in North Georgia and North Carolina, offering over 6 miles of private trophy waters across Georgia, and operate drift boat trips on the Toccoa River in GA and the Tuckasegee River in NC.